Members receive a monthly newsletter, our source of information about upcoming programs and field trips as well as the latest in birding facts and news. When you join, we will send you the most recent newsletter and invite you to our next meeting or field trip. To complete a membership form, click on Membership Application. Note: Memberships are effective beginning September 1 of the ensuing year. Memberships received after June 1 will be applied to the following year. Our club meets each second Monday at 7:00 P.M., September through May, at the Roanoke Council Garden Club 3640 Colonial Avenue in Roanoke. Speakers talk about everything from hummingbirds and songbirds to eagles and owls, with video presentations and occasional live bird exhibits. Guests are always welcome. Meetings also cover field sightings of birds in the Roanoke area. After the meeting we gather for refreshments. A representative of the club frequently talks to local clubs and community groups about the bird club's activities, backyard birding, declining bird species, and wildlife habitat preservation. If you would like to arrange for a speaker please contact Kent Davis at 540-344-8377. The Roanoke Valley Bird Club organizes a full calendar of field trips each year. These trips give members a chance to learn more about birds in the area. 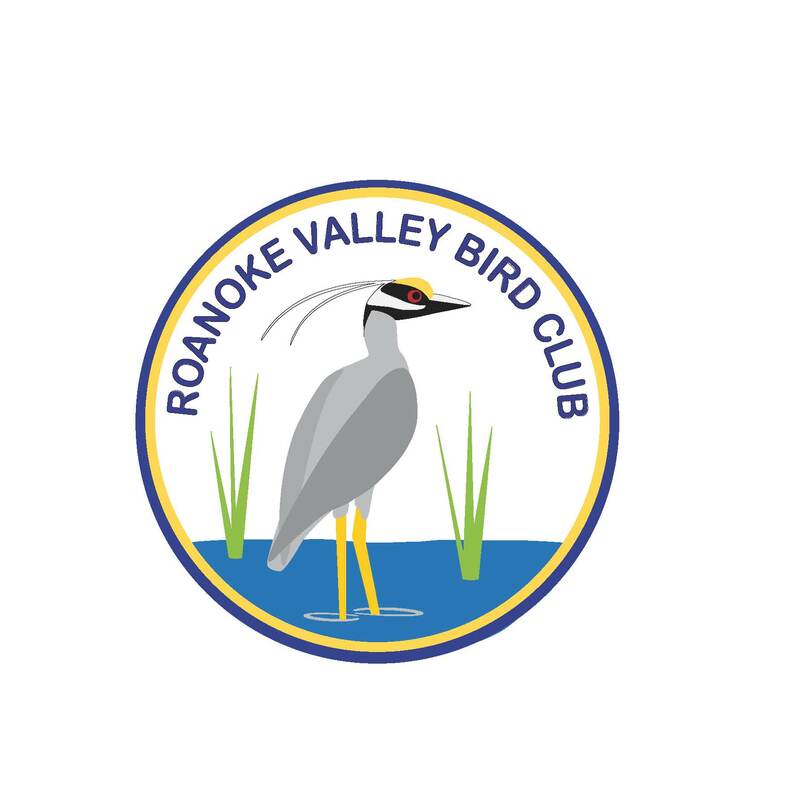 As part of the club’s mission, the information from several of our field trips is used to keep a census of bird populations in the Roanoke Valley. Club members may also attend overnight field trips sponsored by the Virginia Society of Ornithology. VSO trips include Chincoteague, the Eastern Shore, Piney Grove, Mount Rogers, High Knob, and the Outer Banks. In the fall, club members volunteer to watch the skies for migrating raptors at Harvey's Knob on the Blue Ridge Parkway. In the spring and summer, our club sponsors a Bluebird Monitoring Project along the Blue Ridge Parkway and at two local golf courses. Club members volunteer to check nest boxes in order to determine the breeding success of “our” bluebirds. Members also enjoy getting together to build new boxes from funds donated to our Adopt a Bluebird program. Once a year in the fall our club has a bird seed sale to raise funds for the club. We sell quality seed containing little or no waste, at reasonable prices. The sale is open to the public. Refreshments are served, and experienced bird watchers/feeders will be on hand the day of pick-up to answer any questions. Sale proceeds are used to promote wild bird conservation and to support local educational programs.